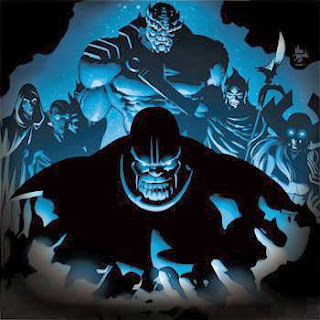 Visit: How to defeat group boss Thanos? Remove A.I.M. from this equation. A.I.M. Soldiers can be found in Mission 1: Tribute or Gauntlet. Defeat either Abomination or Green Goblin in Mission 1: Tribute or Gauntlet. Hints: Can be done outside of spec ops mission. More help is needed on the ground to get the civilians clear of the area. Complete a Deploy in Mission 1: Tribute or Gauntlet. Research the Vigil of Attilan to complete this task. Fight Thanos either on your own map or on your friends' maps for free. Thanos respawns every 72 hours. Royal Flight is Black Bolt's second ability. Black Bolt is a Team-Up in Spec Op 13 Mission 2 and 3. The second confrontation with the Black Order is with the cruel and cunning Corvus Glaive. He is the Boss of Mission 2: A Strange Twist. Whisper is Black Bolt's third ability. Black Bolt is a Team-Up in Spec Op 13 Mission 2 and 3. The Attilan Mace can be researched after acquiring the Attilan Cudgel. Teresing Boost is Dr. Strange's second ability. Dr. Strange is a Team-Up for the Epic Boss of Mission 2: A Strange Twist. Hints: Can be done outside of Spec Ops Map - anywhere if you have Dr. Strange, or Dr. Strange is a team up in missions 5-4, 7-5, 12-3 and 12-5. Avoid doing an Epic Run just for the sake of Task 19 to conserve U-ISO. Power Word is Black Bolt's fourth ability. Black Bolt is a Team-Up in Spec Op 13 Mission 2 and 3. Collect lockboxes to unlock Thane as a playable hero. They can be earned from fighting Thanos or lockbox sidequests. Thanos is the Boss in Mission 3: In Search of Thane. Dormammu is an Epic Boss in Mission 2: A Strange Twist. HINT: Participate in Deploys as soon as they appear. Sealing Touch is Thane's first ability. Thane is a Team-Up in Mission 3: In Search of Thane. Instigators can be found in Mission 3: In Search of Thane. Thanos is the Boss of Mission 3: In Search of Thane. Achieving this score may require Thanos to be fought with Proxima Midnight and Corvus Glaive in the same combat. SPEC OP 13 ONLY! The pieces of the Guardian of Attilan are awarded during combat with Thanos, or can be bought from the store. SPEC OP 13 ONLY! Research for the Guardian of Attilan to complete its construction. How to defeat group boss Thanos? More Update Will Be Available Soon. Please share our links in different forums and website. The game is still instable. F5 all time. Psylocke is 135 CP, not 90 CP. Please correct the information above. So, it will require 360 CP to buy all the heroes to deploy. Strange, this is the highest required CP of all the previous spec ops! 360 CP... Screw this. Luckily I have my 25 gold ready to skip the last task. I started playing the game and mine iso 8 dissapeared i had like 380 of it! Gud luck man! I hope they will give me mine 400 iso back if they do ill by some gold too! Isos come back after you start again. I was researching step 6 when I lost everything, but they all came back, energy too when I restarted. I don't have needed hero for deploy, Can I do it out side epic boss task. I mean in mini-boss or boss fight. @Sagar Sharif Kaiser yup .. but you can use 25 gold = 50CP for that . okay..... mission 7, where the hell is thanos then? I though he's the boss on Spec op3?? major rollback!!! hate this sh!t... now im on task 6 but i cant research the vigil of atillan because its not showing in my research page!!! im not paying 20 gold for it! Actually, I personally don't like to skip any task with golds as spending 25 golds or 50 CP is a waste in terms of their usage i.e. buying heroes/other stuffs. hay.... anyone know when the group boss will be available ? group boss appears once you complete 7 tasks and defeat him from your spec op page...this one is real difficult to play against..
my 26x lv allies of mine are ready for Thanos! I'm on the 7th task. where do you find thanos? You steal this guide and cant even credit the person at least?? Can we do task 19 and 25 outside spec ops?? After You Complete 8 hrs Research. can I finish this task outside spec ops ??? Ok. I am stuck at mission 7 'cause I don't how to find Thanos. .-. cant research....Vigil of Attilan show s locked...any1 know what happend? Hi, my friend can't research the first Vigil of Attilan in the Lab. is there any requirements? Riddle me this, task 22 collect 5 lockboxes - 20 gold to finish??? How about 5 gold to buy the lockboxes at the store?!?!? @Fernando just click the quest at the left and thorus will appear at spec ops mission. No, they don't. it has been over a day and my computer has been rebooted, the program uninstalled and reinstalled and I still don't have the isos back. For the first lockbox task do you have to fight those mini-bosses separately or does it count if you defeat them during the main boss battle? any guides or perfect heroes to defeat him with good damage to earn gold and lockboxes? anyone there knows how to get the attilan cudgel blue print? just finish task (the research thing) and fight thanos for task 7 and you are good to go to do the lockbox sidequest.. This walkthrough doesn't include points required for stars in each mission like usual. I do like numbers. u have to start a spec op mission to spawn Thanos! World War Hulk + Satana. Agent with GBF/Warsplitter Axe/Blade of the Guardian. Do counter attacks count for taks where you have to use a certain attack? @pogiman frias You need to complete 10 tasks to get the blueprint. DONT WOKR ME RESEARCH! I CANT PLAY SPEC OP!!!!!! REPAIR IT or GIVE ME THE BOSS FOR FREE!!!!! does tommorrow's marvel avengers maintenance hampers my research or ISOs i got????? You must fight him with both minibosses. Recommendations for beating Thanos and his two cronies on level 3 to get over 70000 points? I just got slaughtered, but I want the 6 lockboxes prize (and opening up for the next two tasks). You must beat with full HP of your agent and heroes, with overkill one-two bosses. Try use supplies and good luck! try clearing cache... if don't working - https://playdom.zendesk.com/forums/20434338 - Log in and send a question. Wait for reply and mines ISO-8 (if you don't have many boosters of energy - mines energy too). LOL! I am at the final task of spec ops and at the final task of lockboxes sidequests! only two covers left! and only two more gold to skip the last task! :) YAY! Oh! I have a question! if i have finished the first mission of crafting spec ops and have 50 shards, will they remove it? i mean will they be 0 when i get to the last crafting mission? do I have to get 50 shards again!? try take in the team heroes which have highest lvl and being anti-class of boss and mini-bosses. Try give best iso-8 for them. In the end of the battle with bosses (when they eliminated) your heroes and agent MUST BE WITH FULL HP... or almost. What about strategy? I don't bother, took it off and completed the first time... Choose and think up your own way, good luck! I got through with 99k score, the point is to always try and get your team at full health (more bonus score), I use Iron Fist with his praying lotus ability, good for preventing debuffs to your WHOLE TEAM, while healing. @Keron AliThe bad thing is , I'm only at chapter 9 season 1. pity me.. right . if we skip the epic boss and pay the 25 gold do we get the black bolt? not a wise idea bro :) but wish you luck..
yeah, you can, but skipping of tasks for lockboxes - stupid, cost of skipping - x2 amount! of lockboxes which you can buy for gold!!! 4 task very easy, search ways to get 70k, many of typs already there, you can also go on your way. Anyone else already recruit Black Bolt and keep getting an error every time you complete a lockbox or Pvp 11 task where it goes through his recruitment process again as well as tells you you've unlocked the last research and weapon even though you've obviously already done that? It's really annoying. I submitted a ticket to Playdom I was just wondering if anyone else had the same problem. @Andy Gonzalez I recommend using Havok or Omega Sentinel if you have them. You have to team up with Black Bolt anyway who can easily one shot someone every two rounds. Havok and Omega can both also one shot the bosses relatively easily and don't get messed up by counter classes. Kill off Thanos and Proxima and then just focus down Glaive. I think you can remove his nimble buff with mystical munitions or whatever those grenade items are called. in last task what are the hero requirements to fight epic boss..? 4-star mastery - 6-th and last "lockboxes quest", it's parallel to "25-task-mission-for-Black-Bolt"
so... anyone has any idea what heroes we'll use to deploy for the next Spec ops? Stupid question time guys, task 17 Hell on Earth, kill 10 demons. Says they are in Season 1, Chapter 11, do you think I can find the f@*%ers !!! fed up with this now.. 2nd attempt at doing "a matter of life and death. 4 of 6". both times i've gone to use a distress call only for MAA to freeze. it's like the ai. is trying to do something and not resolving... wouldn't mind, but with me only being able to get no more than 20 iso's a fricking day i'm fed up to the back teeth. anyone else having this problem? Visit your allies, collect iso every day from presents and visiting... Hard?